Indian Journal of Cancer (ISSN 0019-509X), the show window of the progress of oncological sciences in India, was established in 1963. 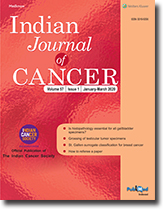 Indian Journal of Cancer is the first and only periodical serving the needs of all the specialties of oncology in India. Its international repute is recognized by its indexing with most bibliographic databases including MEDLINE, Index Medicus, EMBASE and Biological Abstracts.